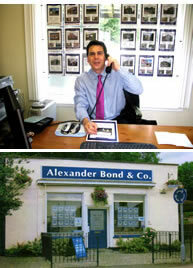 Gino Alexander, the principle of Alexander Bond & Company, started his career in estate agency in 1985. He worked for two large corporate estate agents for about three years gaining excellent achievements and vital experience. In 1988 after becoming aware of the overall disregard held by the publ ic of estate agents he set up partnership in Stevenage to endeavour to change their perception. With his dedication, local knowledge and professional approach he not only survived the property slump of the early 1990's but built up a thriving residential sales and lettings business. After taking time to stand back and look at the property business he has come to the conclusion that there are still clients that are not being given enough care and attention to detail they should expect. He therefore has decided to concentrate all his efforts in helping his clients move with as little hassle as possible and make the cost more comfortable. At Alexander Bond & Company we want your custom and we will sell your home for the best possible price and make your move as painless as possible. Estate agency is a people business. The service that is being purchased is the effort, experience and integrity of the agent involved with the sale of your home. Our aim is to provide a service that is passionate about helping clients and we will provide a truly memorable service. We will look upon each sale as a challenge and work hard towards obtaining the best possible price in the shortest possible time. We will set ourselves high standards that will make you feel happy about using us time and again thus recommending us to family and friends. Alexander Bond & Company have invested a lot of time and research into purchasing the latest state of the art computer technology, colour laser printing, digital photography, floor plans, virtual home tours and estate agency soft and hardware. We are able to produce high quality property details, individual brochures and extensive customer progress reports showing the level of interest on each property including interest levels on the Internet and an automated mailing list via the email to buyers updating them with new properties. When you instruct us to sell your home we will have a full colour brochure with all the relevant internal and external photographs with you within hours. We will also add your home onto our website for everyone in the country and even world to view. Your home details can be emailed or posted the very same day. The benefits of having all the latest equipment are that we are able to focus our effort on telephoning and discussing your home to the right buyers. The buyers that registered through the same process and have been carefully selected using the knowledge we have of them through their initial registration. In return this means that you have fewer viewings that do not really suit and more that actually do. This gives you time to get on with what you want to do.